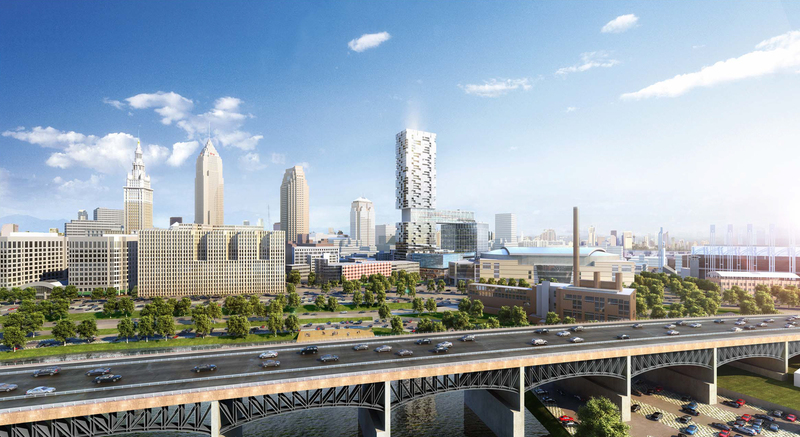 Columbus, OH — A new state bill, dubbed HB 469, has been introduced to the Ohio Senate that would greatly benefit large-scale real estate projects across Ohio. If passed, the legislation would authorize a tax credit of up to 10% of the development cost for “transformational mixed-use developments.” As per the Legislative Service Commission, in order to qualify a project must include a building at least 15 stories high and development cost of more than $50 million, or must include 350,000 square feet of space in some combination of office, residential, hotel, retail, structured parking, or recreational use. Republican state Reps. Kirk Schuring of Canton and Thomas Patton of Strongsville introduced the bill after a conversation with Cleveland developer Robert Stark of Stark Enterprises, who has been working to finance and develop NuCLEus, a mixed-use project across from Quicken Loans Arena in Cleveland’s Gateway district. NuCLEus will have commercial critical mass of almost 150,000 square feet of national restaurant and retail tenants, 500 apartment units, 200,000 square feet of executive office space, and nearly 1,500 parking spaces. According to Steve Coven, Stark Enterprise’s vice president of real estate development, tax credits similar to HB 469, have already helped advance the redevelopment of historic buildings which has led to a visible revival in Cleveland’s central business district. The legislation passed the House 91-0 in late June and was introduced in the Senate on July 5. Read the full article on Crain’s Cleveland Business here.